You are currently browsing the tag archive for the ‘St. Louis Dynamics GP Support’ tag. 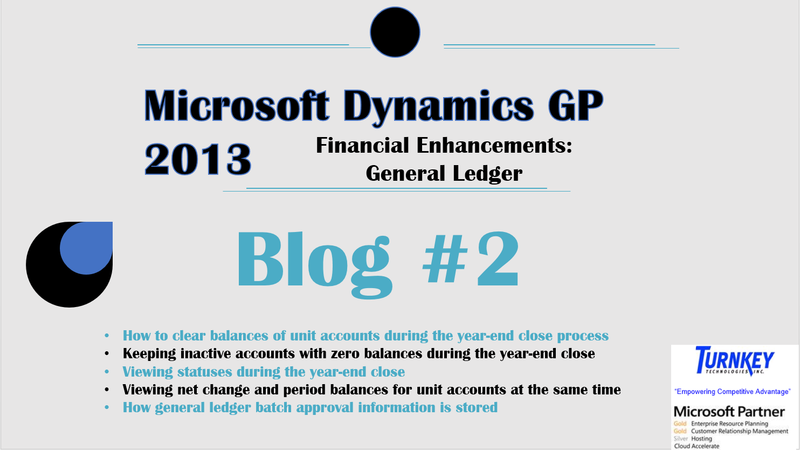 In the previous blog for our Dynamics GP 2013 Enhancements Blog Series we discussed the new General Ledger enhancements. For this installment, we are going to continue discussing financial enhancements, but with a focus on Payables and Receivables Management. These new features will allow you to work more accurately and effectively when managing your cash flow. •Edit Payables Information- With this feature, you can change the remit to address ID on existing transactions. This allows you to edit the payables transaction rather than voiding it and starting over for one incorrectly-entered address. •Reprint remittance forms and check stubs- You can reprint remittance forms and check stubs for posted check payments entered. Since you must keep a transaction history of all the vendors you will be re-creating, these reports will contain all of the details from the original document if the original was printed, the payment wasn’t voided, or if the history wasn’t deleted. •Voiding reconciled payments- A field has been added to the Void Historical Payables Transaction window and the Void Open Payables Transaction window that indicates if payment has been reconciled in Bank Reconciliation. •Voiding check enhancements- When you have credit memos applied to an invoice and want to void a payment that is applied to that same invoice, the credit memo or return is automatically unapplied from the invoice and can be reapplied as needed. •Define labels for user-defined fields in Customer Address Maintenance- The labels for the user-defined fields that appear in the Customer Address Maintenance window can now be defined so that users know what information to track in those fields. •Applying unposted multicurrency cash receipts- You can now apply unposted cash receipts to transactions in the same currency as the cash receipt. •View Checkbook ID- You can view the checkbook ID that a cash receipt was posted to by using the Cash Receipts Inquiry Zoom window. •Combine or modify customer ID’s- If you want to combine or modify customer ID’s, you can import data without having to manually enter the information by using the Customer Combiner and Modifier window. These features allow you to work conveniently and deliver smooth and accurate information without having to go through the trouble of restarting your process. With Dynamics GP 2013, you can access more information faster and in fewer steps. For a high level estimate of your investment in Microsoft Dynamics GP 2013, please use our“FREE” Microsoft Dynamics GP Quick Quote Tool. It will give you a great starting point for assessing your potential investment in a solution like this. By Stephanie Manning and Michael Ramatowski at Turnkey Technologies, Inc.—Missouri, Illinois, and Kentucky Microsoft Gold Certified Dynamics GP and CRM Partner. 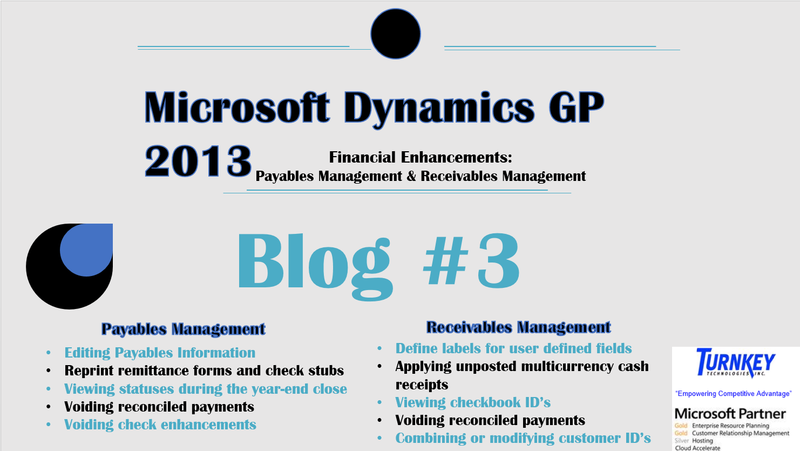 In previous blogs we talked about the Foundation Enhancements that came with the release of Microsoft Dynamics GP 2013. I have decided to do a series of blogs that will contain information about different aspects of GP2013 such as Financial Enhancements, Distribution Enhancements, Human Resources and Payroll Enhancements, and Field Service Series Enhancements. Since we have already talked about the GP 2013 Foundation Enhancements, I will focus this blog around some of the new Financial Enhancements. There are many new financial enhancements but in this blog we are going to focus on the General Ledger. •To clear the balance for the unit account during the year-end close process you can mark the Clear Balance during Year-End Close option in the Unit Account Maintenance window. If this is left unmarked, the balance account is then carried on to the next year during the year-end close process. •Delete all inactive accounts with zero balances. •Keep all inactive accounts with zero balances. •Delete inactive accounts with zero balances that have no budget amounts and keep inactive accounts with zero balances that have budget amounts. After you choose the Close Year button in the Year-End Closing window, a status bar appears, displaying the steps that are completed during the year-end process. With the release of Microsoft Dynamics GP 2013 there have been over 150 enhancements. Microsoft’s team of developers used feedback from their customers and marketing research to determine what needed to be done to make Microsoft Dynamics GP even better than before. These new enhancements make things simpler and put you in a better position to manage your business more successfully. Smartlist Window-A new submenu has been added to the SmartList menu. You can hide the Favorites Pane, increase or decrease its size, and choose to automatically hide it after selecting a SmartList favorite. You can also use SmartList Designer to create a new SmartList from scratch or based on an existing one. E-mail Functionality- For companies using Sales Order Processing, this new feature allows you to send sales back order documents and packing slip documents in an e-mail. For companies using Receivables Management, you can now send customer statements in an e-mail message. You can also send word documents in an e-mail with password protection. This requires that the recipient enter a password before editing the document. Payment Services for Microsoft Dynamics-Address verification is implemented in Payment Services providing an authorization process that validates the card holder billing address information with the merchant bank’s record for the card holder to ensure the card is in the hands of the rightful owner. If the result of the verification is not accepted, the credit card transaction will be voided. Integration Manager-If you do not have a default Integration Manager database when starting Integration Manager, the Select Database window opens. Use this window to select the database you want to open. You also can mark the Set as default database option. If you have any questions or would like to learn more about the wide range of enhancements offered in Microsoft Dynamics GP 2013, please contact us today at 636-237-2280 begin_of_the_skype_highlighting 636-237-2280 end_of_the_skype_highlighting or email us at sales@turnkeytec.com. Today’s customers have a considerable amount of tools at their disposal for researching their future purchases. Consequently, sales teams should be equipped with the tools they need to know their customers and engage them in a way that is relevant and meaningful. Having access to thorough information about customers and products is a crucial element to empowering a sales team. Integrating the back office data of an ERP system with the front-line sales tools of a CRM system gives sales teams the complete, detailed picture they need to properly engage with, and bring value to, the customer. Integrating Microsoft Dynamics GP and Microsoft Dynamics CRM is a simple way to strengthen your sales force. Unique tools have been developed to ease the process and eliminate most of the manual work involved with integrating key data which is already in your system waiting to be used. All you have to do is bridge the gap between the two and your CRM system becomes a high-powered database containing all the information your team needs to interact with your customers. Some key benefits of integrating Microsoft Dynamics GP and Microsoft Dynamics CRM are that you eliminate the need for double data entry and improve data accuracy by reducing opportunities for errors. Integrating your GP data with CRM gives your sales team a complete picture of your customer, including their credit limits and all past interactions with your company. This allows you to eliminate the need for staff to constantly pull transactional data when sales people request “account summaries”. Finally, integrating GP and CRM helps you understand your customer’s overall needs and buying trends to improve service during each customer interaction. Integration also provides additional ways to increase revenue. You can smoothly move customers through the sales process by generating accurate sales quotes, create and execute product-focused sales campaigns that maximize revenue by using inventory and pricing data, and upsell to your customers by suggesting sales items from inventory to pair with their current purchases. Integrating your systems allows greater revenue margins by lowering the cost of selling. The lower cost of selling provides more flexibility on ways that resources can be allocated. Streamlining repetitive order processes and eliminating duplicate data entry frees up time that your sales team can now dedicate to revenue-generating activities. You can shorten your sales cycle by automating your “Quote to Cash” processes. Activities spent between attracting your customer and getting paid can be greatly reduced, which in turn gives your team more time to interact with customers and increase sales volumes. Retaining customers is made easier with Dynamics GP and Dynamics CRM integration. Benefits such as having real-time customer data as you meet with them will help your team deliver a more meaningful sales message. Your customer’s time is important and they will be pleased to see you came prepared by putting in the time to do some basic research about them and their needs. Business intelligence and visibility is greatly improved when Dynamics CRM has access to the data stored in Dynamics GP. Complex data can be summarized and presented to users to help them better understand the customer. For example, daily order transactions can be rolled up to a month-over-month and year-over-year summary by product class, providing insights into buying trends. General account information such as primary address, additional addresses for shipping and billing, accounts receivable details, and credit limits should be considered for integration. Synchronizing this information between GP and CRM helps paint a complete picture and generate accurate sales orders. Information such as products, price lists, price list items, and units of measure can be integrated for increasing visibility for the sales team, generating accurate quotes, executing product-based sales campaigns, and automating order processing. Orders, invoices, recurring contracts, and credit card processing are also important considerations for automating and streamlining transactional processes across the business. This type of data integration allows transactions to be generated and documented from the purchase all the way through to accounting and shipping. With these considerations in mind, we must now look at one way vs. two way integration. Again, this depends on the nature and goals of your organization. For integration that increases visibility and insight, most “set-up” types of data such as products and units of measure should be managed from Dynamics GP and integrated into Dynamics CRM in a read-only capacity. When automating processes from sales to accounting, Dynamics CRM must be able to “talk to” Dynamics GP to relay the information and initiate processes. For these types of objectives, real-time, two way integration must be considered. A major deterrent for companies to integrate their ERP and CRM systems is the perceived complexity of the project. This perception would be well-justified if integrations had to be done manually. Fortunately, there is a tool available that was made specifically for connecting Dynamics CRM and other Dynamics ERP databases. The tool is called Connector for Microsoft Dynamics. Connector is intended for an implementation when Dynamics CRM is used to manage business contacts, track leads, enter sales orders, and perform other sales and marketing activities, and when Dynamics GP is used for accounting, managing your company’s chart of accounts, and maintaining customer, vendor, item, employee, and other records. To make integration even simpler, Scribe has developed templates that integrate key customer-related business processes. The Scribe Microsoft Dynamics GP to Dynamics CRM Template is a highly functional “starting point” for integrating Dynamics GP with Dynamics CRM, from which further extensions and customizations can be made to meet the demands of any business. Integrating Microsoft Dynamics GP and Microsoft Dynamics CRM is a great way to enhance the capabilities of your sales team without having to purchase additional software. Combining the two systems creates value that is greater than the sum of each part. The benefits are numerous, the project is cost-effective, and the integration process is simple. Don’t wait to empower your sales team. Have them running at peak performance with better utilization of tools already at their fingertips. If you have any questions or would like to learn more about the wide range of functionality offered in Dynamics GP or Dynamics CRM, please contact us today at 636-237-2280 , or email us at sales@turnkeytec.com.